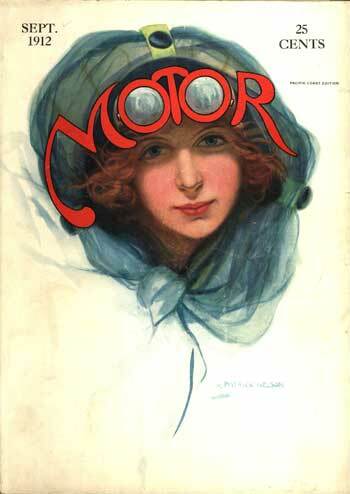 September 1912 Cover. A red-haired, blue-eyed lady wears a motoring hat covered with netting that is tied in a bow under her chin. George Patrick Nelson was born in Brooklyn, New York on April 8, 1876. He completed the eighth grade and, later, was a student of Paris art school Academie Julian. In May 1903, he won first honorable mention in an exhibit at the Art Students League. He contributed illustrations to the New York Tribune, the Boston Sunday Post, and the Chicago Record-Herald. His magazine work included illustrations in numerous magazines, such as Cosmopolitan, Good Housekeeping, Ambition, Woman's Home Companion, The Dial, Printers' Ink, Harper's, Appleton's, and others. He is known for having illustrated stories written by Jack London and Sir Arthur Conan Doyle. There are also records of book illustrations he contributed for Sally Ann's Experience; The Bones of Kahakili; The Land of Long Ago; Flamsted Quarries; and The Gift of the Grass. Among his professional associations were memberships at the Society of Illustrators, the Salmagundi Club, and the Guild of Free Lance Artists.